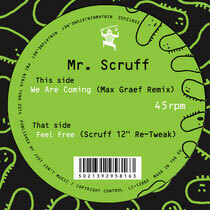 Leaving sunny Stockport behind for a US and Canadian tour this month, Mr. Scruff is preparing to drop a brand new 12", recruiting Germany’s Max Graef to remix the album cut 'We Are Coming'. Graef - who has released a string of low-slung, bumpy house tracks via Box Auls Holz, Brandt Brauer Frick's Gym imprint, Heist and Tartelet - goes in heavy on the sloppy, cosmic funk vibes and builds a thick, groove-ridden seven-and-a-half minute track. On the flip, Scruff turns his attention to 'Feel Free' from his album 'Friendly Bacteria' - re-tweaking the Afro-tinged jazz excursion for the dancefloor. He permits Matthew Halsall (trumpet) and The Cinematic Orchestra's Phil France (double bass) to take centre stage at the outset before morphing into a svelte, sweetly-swung machine-like dance jam. It’s out 8 September on Ninja Tune, check it out below.